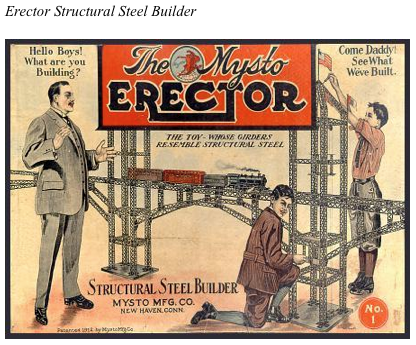 In 1911, A.C. Gilbert watched the New York skyline rise from pre-fab steel girders and beams while traveling to and from New York City to pitch and sell his Mysto Magic Tricks. The beams and girders of the third phase of the industrial revolution were perfect for a toy with an infinite number of configurations—the Erector Set was born. A.C. Gilbert, the father of the Erector Set, modeled for children in toys what he saw in the rise of skyscrapers, the new machines of the age, and related careers. Although sold in predesigned configurations such as a robot, a Ferris wheel, and a baby carriage, Gilbert’s toys were designed to encourage construction. New designs were often contributed by both boys and girls during annual national design competitions. Similarly, in the 21st Century, constructionist and project-based toys and learning tools are emerging to mirror the science, technology, and careers emerging today. In the same way that Erector Sets were patterned after the technologies of the third phase of the industrial revolution, the LEGO MindStorms kits reflect the structure of emerging technology and careers in the 21st Century. In 2006, Nano Quest from FIRST Robotics enabled students to program LEGO robots to mimic biological, chemical, and physical systems across micro-, meso-, and nano-scales. FIRST reports over 200,000 9-16 year old children from over 55 countries competed in the 2011 FIRST LEGO League Food Factor Challenge. This challenge enabled students to play with the systems, design, processes, and languages of 21st-century science, technology, engineering, and mathematics (STEM). Like the world’s leading scientists, students constructed robotic models of materials, structures, and devices by modeling systems from biology, chemistry, and physics, such as complex molecules and their interactions. FIRST NanoQuest (1996) and now Food Factor Challenge (2011) enable students to play with abstract ideas and physical systems through a process of design, trial and error, and inductive reasoning. This shift in education is profound not only because of the pedagogical change in emphasis from axiomatic instruction (presenting information as self-evident truth) to inductive strategies that use observation to move from specific to broader conclusions, because the FIRST Robotic systems subject to design by students are classified as convergent science—what’s next in science and technology. With the turn of the clock to the new millennium, world leaders organized to tackle grand challenges including environmental sustainability, health, alternative energy systems, and human performance, and learning. What was unique about how they organized, is that, for the first time on a massive scale, the National Science Foundation brought together key directorates in computer science, engineering, and virtually all domains of science under the umbrella of technological and scientific convergence (STEM Convergence). “STEM convergence” refers to the process of integrating knowledge and practice across the domains of science, technology, engineering, and mathematics (STEM) to solve challenges and problems faced by humanity and in order to create new possibilities for human sustainability and advancement. This jumping together of knowledge and practice is transformative and gives rise to innovation, new technological systems, new jobs, and new forms of economic productivity and growth. The emerging communications medium of the 21st Century is robotics. Rather than walking, talking robots as we usually imagine, these robots are embedded into the infrastructure and machines of the 21st Century. Mainstream robotic systems today include the iPhone 4’s integrated gyroscope, the automatic brakes and drive-by-wire features such as electronic throttle control in automobiles, and the network of control valves enabling water to flow from the faucet when we brush our teeth in the morning. The motors and machines in our lives—the physical systems—have mated with the cyber systems (software, computer, and network) creating a fourth generation of computers. Snapshot: Progressive’s black box for your car links driving behavior to a usage-based insurance policy, monitoring acceleration and braking motion. Nike+FuelBand: Nike’s new sports bracelet interfaces with a cell phone and tracks physical activity, monitors progress toward goals, and provides incentives. Kickebee: This computerized, stretchable band is worn by pregnant mothers enabling an unborn child to send a Tweet with a kick from within mom’s abdomen. Nuvant Mobile Cardiac Telemetry System: Through a smart bandaid that attaches to the chest to detect and monitor symptoms of arrhythmia, Nuvant alerts patients of an oncoming cardiac episode so that patients can brace for the associated symptoms, which may include disorientation. In these examples, physical and virtual worlds are integrated, delivering a new kind of space—robotspace. A key characteristic of K-12 STEM practice is that science and mathematics are part of the tradition of the sciences and liberal arts, while engineering and technology are part of vocational education and training (now referred to as “Career and Technical Education” in the U.S.). This idea that STEM is multidisciplinary and exists in relation to the world underscores a profound process-level shift in educational practice. The fundamental shift in the learning paradigm moves from the current state of learning to a state that focuses as much on the fundamentals as it does on design, abstraction, systems, inquiry, and connecting to the world outside of the classroom. FIRST Robotics, “For Inspiration and Recognition of Science and Technology,” was founded in 1989 by Segway inventor Dean Kamen. Created to inspire young people’s interest and participation in science and technology, FIRST challenges teams of young people and their mentors to solve a common problem in a six-week time frame using a standard “kit of parts” and a common set of rules. Each solution is unique even though the starting kits are standard. FIRST offers a model for transformation in education because it is in effect a self-organizing innovation network articulating new structures of knowledge, technical systems, social networks, human capital/actors, markets, and social institutions to support STEM education (transcending traditional barriers to education reform). organization of knowledge across traditionally isolated disciplines, technologies and domains of application, design and process (systems) orientation and activities, linkage of markets and consumers through a feedback loop enabling educational adaptation and change (as well as product evolution), formation of human capital talent networks that integrate knowledge and practice (praxis) to create new knowledge, processes, systems, and languages of innovation, and revitalization of social institutions and creation of new institutions linking industrial organizations, schools, government agencies, and civil society through both formal and informal networks. FIRST Robotics creates a conversation, space, and time for educational reform. FIRST Robotics is an indicator of what is next in K-12 education including its emphasis on STEM convergence , project-based learning, inductive learning strategies, and design. FIRST’s Food Challenge for elementary and middle school students and teachers mirrors the system-of-systems characteristic of convergent science. Beyond FIRST Robotics, the “MAKER,” “HACKER,” “MOD,” and “Do It Yourself” movements are converging with STEM education. Similar to the early PC era, kits for cyber physical systems and robotics are now mainstream. What is different today is the widespread availability of advanced technologies at relatively low cost, and the emerging integration of cyber and physical systems. For example, the January 2012 issue of Make magazine is titled “Do It Yourself SuperHuman” with topics including “feel remote objects with sonar, control machines with your eyes, play video games with electrodes on your brain, see heartbeats with LEDs and auto-check your blood pressure.” To learn more visit: SPARKFUN ELECTRONICS, INSTRUCTABLES, MAKEZINE, MAKEZINE CHANNEL, MOD MAGAZINE, MAKERFAIRE and DO IT YOURSELF NETWORK. The tools and technologies for DIY projects have fallen to a price point such that anyone can be a designer, creator, and inventor of the future; however, the “Achilles heel” of education, industrial policy, and professional/academic societies is the general disregard for applied learning practice and the cognitive dissonance often encountered when one mentions “complexity” and topics requiring abstraction and/or systems knowledge. According to Dr. David Thornburg, “While it is the case that K-12 math, science, and technology are taught as separate subjects in school, the power of treating the STEM subjects in an integrated fashion strengthens the understanding of each subject and their relation to other subjects, careers, jobs, and disciplines.” (Personal Interview, Dr. David Thornburg, Thornburg Center for Professional Development, Chicago, IL, September 16, 2008). In 1993, Project 2061 of the American Association for the Advancement of Science highlighted the integrated nature of the scientific enterprise, yet, we are no closer today than we were in 1993 to realizing the transformative nature of holism in science: By “science,” Project 2061 means basic and applied natural and social science, basic and applied mathematics, and engineering and technology, and their interconnections—which is to say the scientific enterprise as a whole. The basic point is that the ideas and practice of science, mathematics, and technology are so closely intertwined that we do not see how education in any one of them can be undertaken well in isolation from the others. What is emerging today is a practice that is moving the tools of industry and the scientific workbench to our schools so that children can experience a systemic implementation unifying theory and practice. The goal is ultimately to cultivate innovation in education and the next generation of innovators across disciplines. STEM’s reach is greater than the 6.4 percent jobs typically categorized by the Bureau of Labor Statistics—rather, it is the whole–it is the new dot com in the 21st Century. Children today have access to the equivalent of $100s of millions of dollars of computing power in their toys, phones, and video games. This is leading to a revolutionary “systems” orientation in the cyber physical toys and learning tools available to children. Just as A.C. Gilbert modeled what he saw in the rise of skyscrapers in 1911, today emerging educational products and toys such as those exemplified by LEGO, FIRST Robotics and the DIY movement model the characteristics and systems of 21st Century science, technology, and careers. Jim Brazell is a technology forecaster, public speaker and strategist focusing on innovation and transformation. Since 2003, Jim has authored several emerging technology forecasts and briefs in addition to consulting on international technology innovation strategies in Portugal and the U.S. Jim’s mentor and collaborator is Dr. (Col.) Francis X. “Duke” Kane who was recognized in March of 2010 as a catalyst of the global positioning system (GPS) among other achievements. Jim and Duke are the co-founders of spaceTEAMS in San Antonio, Texas, targeting the first person to walk on Mars to be from San Antonio. Informal learning is the trend! I heard about this new education box from Harvard called CubbyCase that looks amazing, too! Would be great if you reviewed them!